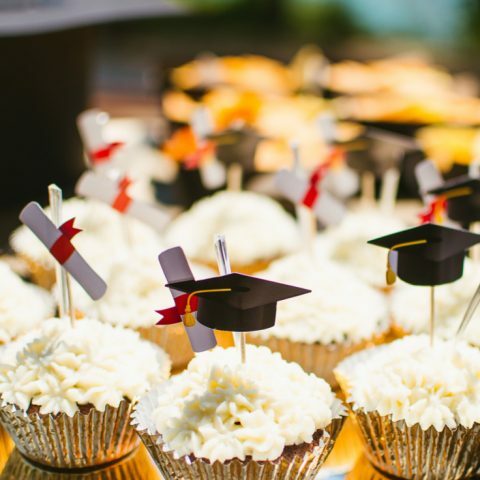 Throw a backyard birthday party! The great outdoors are an even greater idea when a birthday is involved, and a backyard. 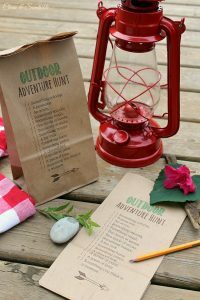 I’ve had birthday party ideas, camping party ideas, and even backyard party ideas -but combining them all into one?! Genius! 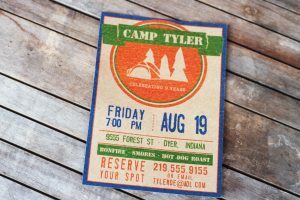 A savvy party planner like you might also craft up something more homespun-looking, one that resembles an outdoor flier, or a burned-edges treasure map idea. We can’t have a birthday party without cake, even if you’re holding this shindig at a spot in the woods. 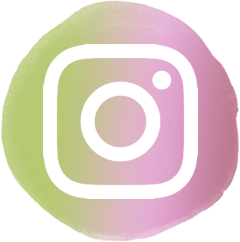 Given that, I thought simple would be best. We’re not looking for fondant-shaped campers and tents if we’re busy picking up firewood, after all. 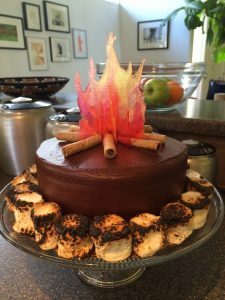 This chocolate cake owes its campout design to basic accents: pirouette cookies (cigar cookies) for firewood, melted sugar “fire,” and toasted marshmallows circling the base. You can create fire with fancy sugar-melting skills, with Jolly Ranchers, or by picking up tissue paper over at Michael’s. 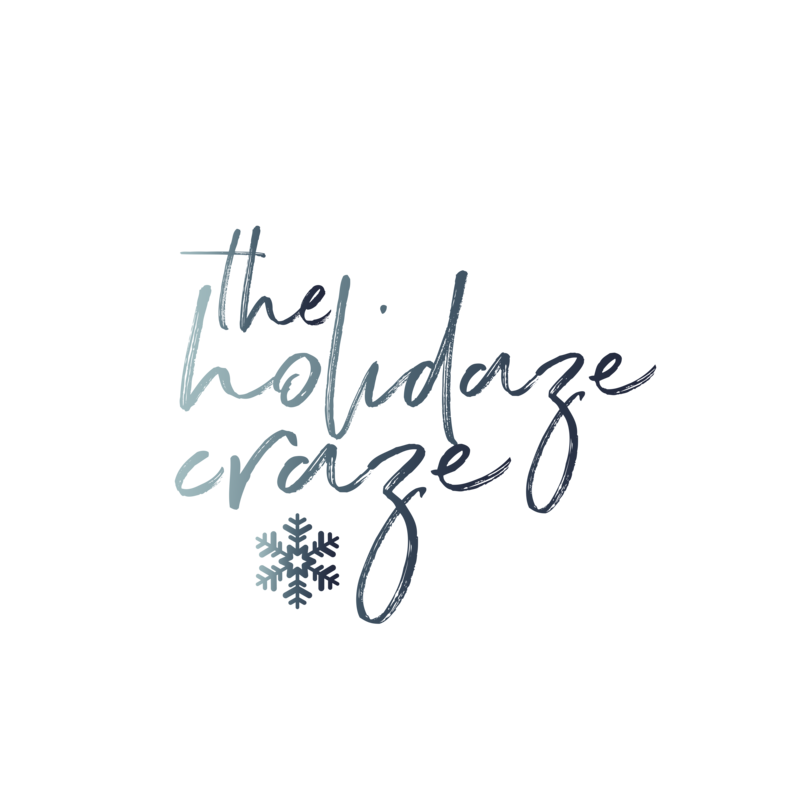 We said, “simple,” right? We could go truly authentic and make everyone carve his own forks while eating cake off a piece of bark. 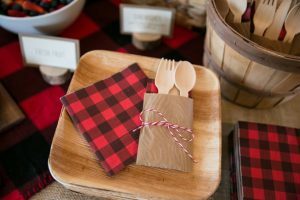 Or… shop the plaid section of the party store and pick up some nifty wood plates and utensils as complements. You’ll get authenticity without tongue slivers, which definitely makes for a better backyard birthday party. Now that we’re talking setup, how are you planning on decorating the table? If there’s one constant in the universe, it’s the need for food. Trust me on this. Campers are no exception. Roughing it can really build up appetites. When I thought of camping and food; I thought tin foil dinners, hot dogs, marshmallows, and trail mix. 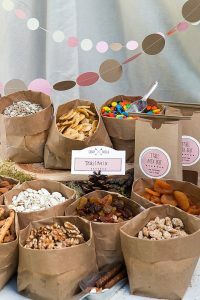 Instead of the store varieties, though, I loved this snack suggestion of letting happy campers mix their own. You’ll need M&Ms, dried bananas, raisins, oats, granola clusters, dried fuits, nuts, and coconut flakes. Oh, and paper bags to hold their masterpieces. 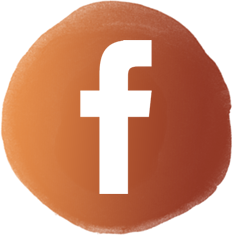 I’m glad you didn’t burn down my webpage and leave before scrolling down to here. I’m all about S’Mores. I just felt they were important enough to mention separately. Since they are such a vital component of camping, we’re going to do a S’Mores bar. 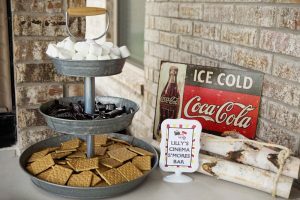 Everything a roaster needs should be on the table: marshmallow roasting sticks, Hershey’s chocolate, marshmallows, and personal additions like other candy pieces. During daylight hours, however, let’s have the kiddos forage for non-poisonous leaves. That should take a good ten minutes. 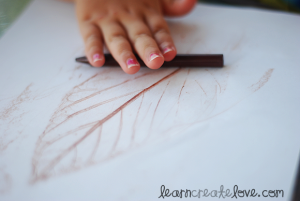 Next, arm them with paper and crayons and have them make leaf rubbings. 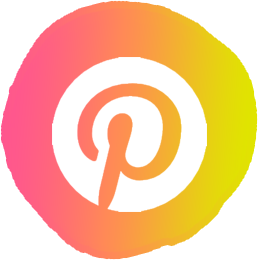 Make it more interesting by giving them frames or banners to display their artwork. Another great time-filler is a word search. 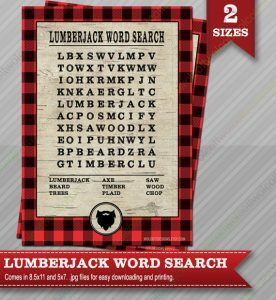 Try this lumberjack one, or print out a free camp themed game. While you’re finding fuel for a fire, they could be finding “wood.” It’s so perfect for your backyard birthday party! 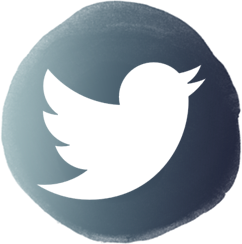 Lastly, and bestly, send everyone on a scavenger hunt. Print the list onto paper sacks as a two-for-one way to be prepared. 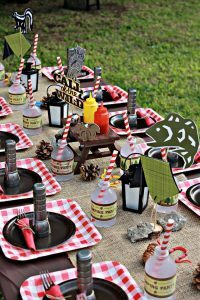 It may not be fair, but I always have favorites when I look up party ideas. Today, it’s these bindle party favors. 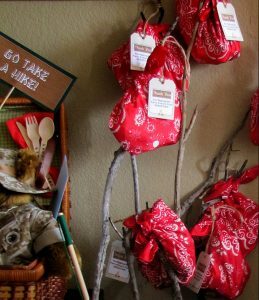 These are red handkerchiefs tied around sticks. You know, like a cute throw-back to a kid running away into the wild. I don’t even care what’s inside, but your guests will. Let’s stock them with relevant supplies; like a magnifying glass, compass, whistle, snack, instant towel, and miniature canteen.